For other uses, see 11th Battalion (Australia). Raised at Northam, Western Australia, on 13 October 1939, the 2/11th Battalion formed part of the 6th Division of the all volunteer Second Australian Imperial Force, which was raised for service overseas at the start of the war. The majority of its personnel were recruited from Western Australia, and the battalion was the only infantry battalion of the 6th Division raised outside of New South Wales or Victoria. The colours chosen for the battalion's Unit Colour Patch (UCP) were the same as those of the 11th Battalion, a unit which had served during World War I before being raised as a Militia formation in 1921. These colours were brown over light blue, in a horizontal rectangular shape, although a border of gray was added to the UCP to distinguish the battalion from its Militia counterpart. With an authorised strength of around 900 personnel, like other Australian infantry battalions of the time, the battalion was formed around a nucleus of four rifle companies – designated 'A' through to 'D' – each consisting of three platoons. After completing rudimentary training at Northam in November, the battalion moved to Greta, New South Wales, where it was concentrated with the other three battalions of the 18th Brigade, which formed part of the 6th Division. The 2/11th remained in New South Wales until March when it returned to the west and subsequently departed from Fremantle, bound for the Middle East. After arriving in Egypt further training was undertaken there and in Palestine. The battalion was later re-allocated to the 19th Brigade after the Australian brigades were reorganised into "triangular" three battalion formations. In early January 1941, the 2/11th saw action during the Battle of Bardia, fighting against Italian forces in Libya. Further actions followed later in the month around Tobruk and Derna, and then around Benghazi the following month. 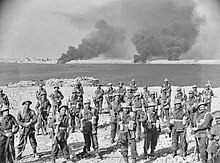 The Australian 2/11th Infantry Battalion regroups on the escarpment at the south side of Tobruk harbour, after penetrating the Italian outer defences and attacking anti-aircraft positions, 22 January 1941. In April 1941, the battalion fought a brief and unsuccessful campaign in Greece, and then on Crete the following month. On Crete, the battalion was heavily engaged while attempting to defend Retimo airfield and a large number of the battalion's personnel were killed or captured. As a result of the casualties suffered in Greece and Crete, the battalion was virtually destroyed and the 2/11th had to be rebuilt in Palestine at the end of 1941, before joining the Allied garrison that had been established in Syria following the conclusion of the Syria–Lebanon Campaign. It was brought back to Australia in early 1942, after the Australian government decided to transfer the bulk of Australia's ground forces from the Middle East to the Pacific to meet the threat posed by Japanese forces which were advancing rapidly through the Pacific. After landing in Adelaide in March, the 2/11th was attached to the 2nd Brigade, a formation made up largely of soldiers from the Militia, carrying out defensive duties in Western Australia. The battalion was transferred back to the 19th Brigade in Queensland in July 1943, and in late 1944 was committed to the Aitape–Wewak campaign. A mopping up operation, the campaign was one of a series of patrols and advances: at the start of the campaign in January 1945, the 2/11th were assigned to an area on the eastern bank of the Danmap River and as the campaign progressed advanced south of Wewak, moving into the Prince Alexander Mountains throughout April and May and into July 1945. At the conclusion of hostilities in August 1945, the battalion's personnel were sent back to Australia for demobilisation in small groups until mid-November when the cadre received passage home. The remaining personnel of the 2/11th subsequently concentrated at Puckapunyal where the battalion was disbanded on 7 December 1945. During the war a total of 2,939 men served with the 2/11th Battalion which suffered 489 casualties, of whom 182 were killed. Its members received the following decorations: two Distinguished Service Orders, six Military Crosses, four Distinguished Conduct Medals, 20 Military Medals and 66 Mentions in Despatches. In addition, one member of the battalion was appointed as an Officer of the Order of the British Empire, and three were invested as Members of the Order of the British Empire. North Africa, Bardia 1941, Capture of Tobruk, Derna, Greece 1941, Brallos Pass, Middle East 1941–1944, Crete, Retimo, Matapau, Abau–Malin, Wewak, Wirui Mission, South-West Pacific 1942–1945, Liberation of Australian New Guinea. These honours were subsequently entrusted to the 11th Battalion in 1961, and through this link are maintained by the Royal Western Australia Regiment. Lieutenant Colonel Charles Green (1945). ^ a b c d e f g h "2/11th Battalion". Second World War, 1939–1945 units. Australian War Memorial. Archived from the original on 22 August 2009. Retrieved 16 August 2009. ^ Long 1952, p. 52. ^ Keogh 1965, pp. 400–408. ^ Festberg 1972, pp. 70–71. ^ Festberg 1972, p. 32. ^ "WX2 Thomas Steane Louch, MC". People. Australian War Memorial. Retrieved 7 October 2014. ^ "WX5 Colonel Raymond Ladais Sandover, DSO". People. Australian War Memorial. Retrieved 7 October 2014. ^ "HM Binks". Orders of Battle. Retrieved 7 October 2014. ^ "NX121 Lieutenant Colonel Charles Hercules Green, DSO". People. Australian War Memorial. Retrieved 7 October 2014. Keogh, Eustace (1965). The South West Pacific 1941–45. Melbourne, Victoria: Grayflower Productions. OCLC 7185705. Long, Gavin (1952). To Benghazi. Australia in the War of 1939–1945. Series 1 – Army. Volume I (1st ed.). Canberra, Australian Capital Territory: Australian War Memorial. OCLC 18400892. Palazzo, Albert (2004). "Organising for Jungle Warfare". In Dennis, Peter; Grey, Jeffrey (eds.). The Foundations of Victory: The Pacific War 1943–1944 (PDF). Canberra, Australian Capital Territory: Army History Unit. pp. 86–102. ISBN 978-0-646-43590-9. Olson, Wes (2011). Battalion into Battle: The History of the 2/11th Australian Infantry Battalion 1939–1945. Welshpool, Western Australia: Quality Press. ISBN 9780646563633.